Finally a way to give our Ancestry.com cousins a chromosome browser! If you have not been able to convince them to use GEDmatch, perhaps it will be easier to convince them to transfer their data to Family Tree DNA – that wonderful and very reputable company which started the personal genome testing revolution. This is a more private way to compare data than at GEDmatch since only your DNA matches can see your information and compare where they match you. There is a free transfer which gives you an account with just your matches. Or for $19 you can transfer to a full featured account there with all your matches and ancestry composition (called MyOrigins). This transfer is possible since you already have the raw data from the DNA test. The link for uploading your results from another company (including MyHeritage) is at the top left under DNA Tests [update 30 sep 2017] . So I decided to try it out by transferring my brother’s data from ancestry to a free FTDNA account, since I already had downloaded his raw data a while ago. It went smoothly and I immediately got an email with his login userid and password. I was told to wait an hour for his matches. So I decided to write this post while I waited. Next I exported a GEDcom from my genealogy program with 12 generations of his ancestors and 4 generations of their descendants in order to upload that to FTDNA. So I logged into his new account and clicked on Family Tree under My DNA. The page that came up had a big red message pointing to the little gear icon on the bottom right telling me I could upload a tree. So I did. Interesting that family tree DNA gave me a warning message that I would be overwriting his tree when there wasn’t one there. However I liked that when I went to the family tree page again it asked me if I wanted to show deceased people in the last 100 years or not. I selected the option to show them to my DNA matches only. Another way to get an upgrade is to refer four people. My brother, aunt, my cousin, and my husband all got the four referrals for the upgrade. Once you get the four it gives you a message that it will be 1-2 business days before the account is finished processing. This has worked now; so thanks very much to all of you, my dear readers! So please use a link there to start your transfer or click on this link to Family Tree DNA to unlock one of my cousins. I wonder if you use this free transfer option and are given an FTDNA account, whether this transferred file would now be considered a FTDNA file? And if you’re able to then download this converted file, I bet it could be used on DNAGedcom which only accepts FTDNA and 23andMe files. Wouldn’t that be nice. Very clever idea. Should work on the full accounts. why are only V3 23andme files accepted and not the latest ones? What if/or anything extra you get if you already have a ftdna kit and you do a 23andme v3 transfer ? I uploaded 6 new DNA kits to FTDNA. When they advertised the closest 20, it’s actually not quite accurate because new uploads aren’t included in that even if those uploads are of close relatives. Also, the “free” program does not benefit those who already have accounts on FTDNA because they aren’t privy to matching the new uploaded DNA. I was pretty disappointed. I did get one free account but again, his closest matches aren’t shown to him. Jeri, I think the idea is to give you a free look at your matches in the existing database to see if it is worthwhile paying the $39, which is an amazing bargain. I have a kit from 2014 I’d like to upload. Do I still pay $39 or is there a different fee? If it is from 23andme, you cannot upload it as the new chip is incompatible, you will need to submit a new test at the normal price. Ancestry is fine to upload. Maybe I’m missing something. I did the upload and paid the $39. I get matches but is there any way to show how the DNA matches actually match up to humans in the trees (like ancestry does)? 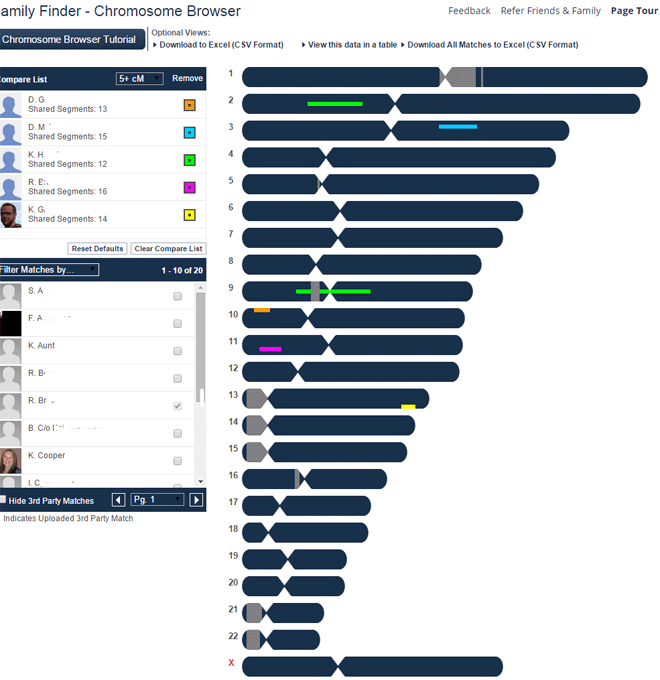 The reason those of us who love genetic genealogy prefer the other DNA sites is that we can see where in our DNA a match is and compare that to others we match by using a chromosome browser. However no other testing site will search the trees yet. There is a utility called Gworks (the old pc based version is called GCU) which will try to do the tree matching for you using GEDcoms that you must upload. It is at http://DNAgedcom.com – that site used to be able to grab GEDcoms from family tree DNA but when they changed the tree there that feature stopped working. Wait a week and then I will blog about it once it is back. very useful post. before reading this post I didn’t know about Family Tree DNA. I have learned much from about this from your post. thanks for sharing and raise my knowledge. I paid the fee and uploaded one DNA to FT DNA. Do I have to pay $39.00 for each upload. I read someplace if you upload 2 or more it is free. I have two more to upload. Sorry you have to pay for each one, although if you have five to do that can be done for the price of four. Four referrals get you a free “unlock” so you would not pay for the first one and then refer your own extra kits. There are places you can post your link to get the unlocks as well. One is listed here, the other is over on facebook, look for groups with ftDNA in the name. What I’m wondering is… I had a recent DNA test completed by Ancestry and I also have a test pending from FamilyTree. Should I wait for the FamilyTree results to be posted before I upload the Ancestry test? I like the site. I have 5 kits pending with Ancestry. When I upload to FTDNA how do I let them know that the other 4 are “my” referrals? I forgot to ask this also. All 5 are on the same family tree, do I need to upload it to each person’s kit, or how would I upload just the 1 and link everyone to it? Each person gets a separate account. I usually upload just 10-12 generations of ancestors otherwise some people get confused and think that the common ancestor is a relative by marriage. I had noticed in an earlier post that you mentioned uploading 12 ancestor gens and 4 descendent gens. Is that a pretty standard size tree to use on these sites where you are not actively working on the tree itself? In other words for matching purposes. Yes pretty standard size for DNA matching although I no longer put anything but direct ancestors to prevent confusion on these sites. Has this blurb now posted at the FTDNA transfer site been there very long? *Please note that AncestryDNA™ has recently changed their file format. The updated version is currently not compatible with our transfer program, however we are working on accepting the newest version in the very near future. We only accept autosomal raw data files from Ancestry DNA & 23andMe V3 (sold from about Jan 2011 to Oct 2013). It’s a very new blurb. I compared old and new Ancestry DNA files, line by line. V1 = 701,478 total. V2 = 668,942 total. Gain of 20,293 on Chromosomes 16, 17, 19, 22-26. They appear to be especially interested in Chromosome 23, which went from 17,604 to 28,892 lines of rsid’s and alleles. Thank you for your observations. I repeated them in the latest comments on my post about the new ancestry chip and added an explanation of what chr 23,24,25, and 26 are. I thought I uploaded my raw DNA from Ancestry.com but No matches appear I went back and paid the $39 and still no matches yet when I go to upload DNA again it says I already uploaded DNA . I thought maybe I didn’t do it right so I went to Ancestry.com and downloaded my raw DNA to my computer again. Why can’t I see any matches at all? I forgot to mention it is FTDNA that I uploaded my DNA to. I would love to know about my father side. I want to know about my grandfather. I want TO KNOW WHAT HE look like. I am a black person. does anyone have any idea when FTDNA will be compatible with ancestry again so we can upload? So my mother-in-law gave my husband and me the funds to do our DNA for Christmas. I still have not ordered any kits. Don’t know which one to do. Still trying to understand all this. She did Ancestry for herself her husband and one son. I am looking for family links. Trying to still convince my father to participate so I can get a better match on his side. If I do Ancestry, I know I can upload to Family Tree for $39. But if I do Family Tree, can I upload to Ancestry? What are the pros and cons of this so I can make a decision. Thanks in advance for any assistance. You cannot transfer family tree DNA to ancestry. But any day now, the transfer from ancestry to family tree DNA will be working again. I have an AncestryDNA test. I’ve heard that the AncestryDNA tests aren’t the most accurate. Say I were to upload the raw data from that to FTDNA (and pay $39)–would I get the same results from that versus if I paid for a new test with FTDNA? In other words, is the issue with the AncestryDNA test a problem with the raw data or with the site’s analysis of that raw data? Thanks! Al of these personal DNA tests are accurate for close family, fuzzy for more distant family, and less accurate for ancestry composition which is still a new science. There are differences in the way ancestry analyzes the raw data which removes many matches, mostly not good ones. If you suspect that there were too many errors with your initial test, you can use the kit analysis at GEDmatch by uploading there and then disease if you want to get your DNA done again. If I transfer my brother’s dna from ancestry to ftdna (where I tested) so that I can see what matches there are on ftdna will HE still be able to use his ancestry dna account and see matches on there? Do you know if I need to make a new account for myself on FTDNA to transfer my Ancestry DNA to FTDNA? The reason I ask is I made an account for my DAD and bought him the Y-137, I think and anyway, I was hoping I might be able to load mine on that account and put it under me on the family tree, so I could compare some of the basic results. Or do I need a separate account for each person? You need a separate account at family tree DNA for every person. Has there been any fix to the issue with uploading Ancestry DNA to the Family Tree site? I am getting the same error message that other people were getting.